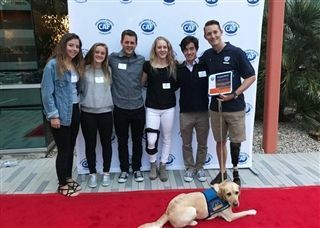 Members of the upper school service learning group Opportunities for Athletes attended the Challenged Athletes Foundation Grant Night on May 12 to present a grant to an athlete in need. Students raised $8,000 by selling t-shirts, hosting events on campus and through donations. On Friday, they provided a grant to athlete Mike Johnston for a new bike that will allow him to start racing. He is part of the Operation Rebound program, which helps impaired members of the Armed Forces.